Northern Ireland's World Cup campaign got off to a disastrous start as some bad defending sent them crashing to a 3-0 defeat at home to Poland. Maciej Zurawski scored the opener after just three minutes direct from a corner which NI keeper Maik Taylor could only help into the net. Poland sealed victory with further goals from Piotr Wlodarczyk and Jacek Krzynowek on 36 and 57 minutes. Wlodarczyk was sent-off late on and misses Poland's game against England. Northern Ireland had gone into the game with high hopes after a six-match unbeaten run under manager Lawrie Sanchez. But Sanchez's first competitive match in charge got off to the worst possible start when Poland made that breakthrough from an early corner. Zurawski's kick from the left was not dealt with at the near post by Damien Johnson and a stunned keeper Taylor was caught by surprise. Wlodarczyk then got number two when Craigan failed to get a challenge in. Poland got their third as Northern Ireland pushed men up. Krzynowek took advantage to fire home a superb shot from the edge of the area, which left Taylor stranded. 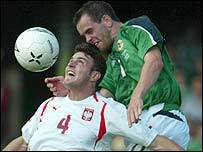 Liverpool goalkeeper Jerzy Dudek made a fine reaction save to deny Aaron Hughes a late consolation for Northern Ireland. Hughes also missed the target with a free header in injury time. The only blot for Poland was Wlodarczyk's 80th-minute dismissal for striking out at Mark Williams, which means he is automatically suspended for the next qualifying game against England on Wednesday. Northern Ireland will have to pick themselves up quickly as they face Wales in their second qualifer in Cardiff on Wednesday. Northern Ireland: Taylor, Aaron Hughes, Craigan, Williams, Capaldi, Elliott, Johnson, Whitley, Michael Hughes, Quinn, Healy. Subs: Carroll, Murdock, Clyde, Smith, McVeigh, Jones, Gillespie. Poland: Dudek, Mila, Rzasa, Zewlakow, Glowacki, Bak, Zienczuk, Krzynowek, Zurawski, Lewandowski, Wlodarczyk. Subs: Boruc, Klos, Rasiak, Baszcyznski, Radomski, Gorawski, Kryszalowicz.